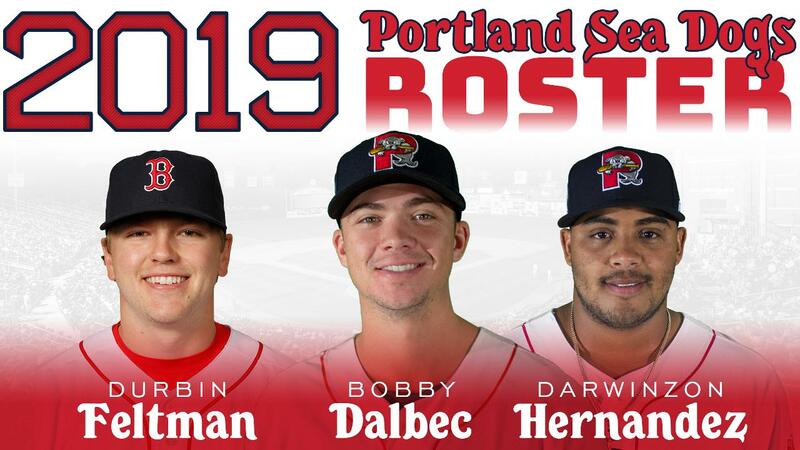 Portland, Maine - The Portland Sea Dogs in conjunction with the Boston Red Sox have announced the 2019 Preliminary Roster. Opening Day is Thursday, April 4th against the Reading Fightin Phils (Phillies affiliate) at Hadlock Field. The roster features eight of Baseball America's top-30 Red Sox prospects, including top overall prospect, Bobby Dalbec, and top-pitching prospect Darwinzon Hernandez (#3 overall). The remaining prospects; right-handed pitcher Tanner Houck (#7), infielder C.J. Chatham (#10), right-handed pitcher Durbin Feltman (#11), right-handed pitcher Denyi Reyes (#18), right-handed pitcher Kyle Schellenger (#23), and infielder Brett Netzer (#29). Hernandez and Reyes are the two players on Boston's 40-man roster. Eighteen players from previous teams are included on the preliminary roster: Pitchers Matthew Gorst, Hernandez, Kyle Hart, Dedgar Jimenez, Matt Kent, Adam Lau, Daniel McGrath, and Jordan Weems, catchers Charlie Madden and Jhon Nunez, infielders Dalbec, Jeremy Rivera, Josh Tobias, and Jantzen Witte, outfielders Tate Matheny, Joseph Monge, Aneury Tavarez, and Luke Tendler. Chatham, Feltman, Houck, Netzer, Reyes, and Schellenger are the six players set to make their Double-A debuts. Outfielder Keith Curcio and right-handed pitcher Andrew Schwaab make their debuts in the Red Sox system. Catcher Oscar Hernandez spent last season with Triple-A Pawtucket and makes his Sea Dogs debut. Hernandez is the lone player on the preliminary roster with Major League Experience (Arizona, 2015-16). Breakdown by how acquired: 16 players drafted by the Red Sox, four players signed as international free agents by Boston, four players signed as minor league free agents by Boston two players acquired in the minor league Rule 5 draft, and one player acquired via trade. Manager Joe Oliver begins his first year as Portland Manager, after spending last year with High-A Salem. Oliver is joined by Pitching Coach Paul Abbott (2nd year), Hitting Coach Lee May Jr., (3rd year) Coach Angel Sanchez (1st year), Trainer Scott Gallon (3rd year), Strength Coach Ben Chadwick (1st year) and Assistant Trainer Eric Fasth (1st year). The Sea Dogs open up their 26th season on Thursday, April 4, against the Reading Fightin Phils (Phillies affiliate) with a 6:00 p.m. start at Hadlock Field. Tickets are available at seadogs.com or 207-879-9500. Book your nine-inning vacation today!